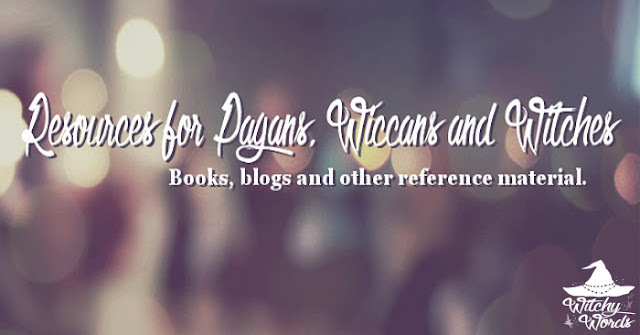 The following will cover a list of resources for pagans, Wiccans and witches, including a variety of material ranging from books to blogs, apps, podcasts, Youtube channels and more. This list has been updated from last year's version, including more books and blogs as I've discovered them, and now lists sections in alphabetical order to make it easier to find what you need! Before we begin, I would encourage you to read my article entitled 13 Critical Reading Tips for Pagans, Wiccans and Witches. A wide array of circumstances can affect the validity of a text, which is why it's so important to hone your critical thinking skills. It's rare to find a book that isn't problematic in some way but that doesn't mean that the whole of the text is useless. By reading critically, you can read a wider range of texts without them forcibly shaping your personal paradigm. Resources on this list may contain problematic or triggering language but have been included for the useful information they provide around the issues they have. Finally, in the past, I've included a miniature review of the books. I will no longer be doing so in this version because I want the reader to develop their own opinion of the text. I'm not here to shape your craft but rather to guide you in shaping your own. The following list includes 101 books and beyond, beginning with general paganism, moving into witchcraft and continuing into a variety of practices, entities and so forth. It finishes with a list of websites, blogs, apps, podcasts and YouTube channels that specialize in the Craft. Each is linked to either the corresponding website, Youtube channel, app, blog, etc or to an Amazon link for purchase. This is obviously not a comprehensive list but more a list of texts I have enjoyed in some fashion. Good luck! Great resource, thank you! :) Will save this for future reference. I love Tess Whitehurst's books and also like Deborah Blake. I'm currently reading Deborah's A Year and a Day of Witchcraft. Another author I really like is Kate West. All great authors! Thank you so much! Thank you for this list! I'm going to find it very useful. Of course! I'm so glad it can help! Great resources! Though I'm a little sad that my magazine didn't make the list, Spiral Nature. Thanks for sharing! Thank you so much, Nico! Thank you for the list. When it came to entities I never really took a stance beyond cleansing houses of energy and tended to prefer faeries in the garden rather than my house. But, I've been encountering spirits more often in recent years and with relatives passing away have wanted to find ways to honor them,I trust a list you put together far more than a google search. So, thank you. Thank you so much, Magi! I hope this list has helped you in your research. If you have any questions, I'm always happy to answer them. Good luck to you!